In 2018 Finger Lakes Extrusion installed a large scale solar array. The 1634 panel system is on both the roof and grounds of the company’s 5 acre facility. Annually this system will offset 80% of the electric usage demanded by our operations. Electric is one of the largest overhead costs incurred by Finger Lakes Extrusion as all of our production equipment is powered this way. 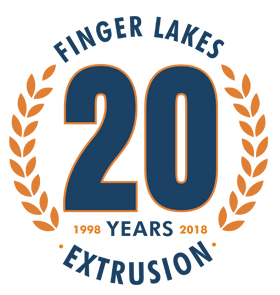 Not only is it very exciting to minimize a production cost, but Finger Lakes Extrusion is proud to reduce their carbon foot print as well. A TV screen in the facility will display the current energy generation, cumulative production among other data points for employees and customers alike to view.